Vice President Mike Pence will be delaying his upcoming trip to Israel and Egypt for the second time in the last week, according to his office. 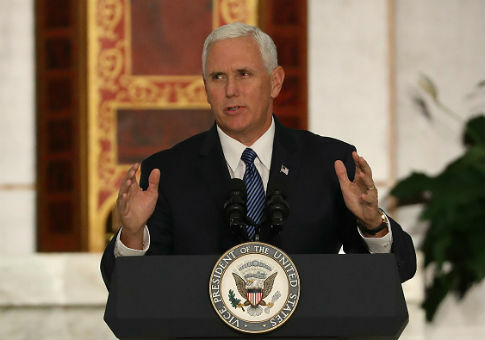 Spokespeople for the Knesset, the name for Israel's Parliament, the Israeli Foreign Ministry, and Pence's office confirmed to CNN and Haaretz last Thursday that the vice president's visit would be postponed until this week. However, Pence's office confirmed on Monday that his visit would be pushed back again until January 2018, Politico reported. Pence, who was originally scheduled to arrive in Israel on Sunday and then rescheduled to leave on Tuesday for a brief visit in Egypt before arriving in Israel for a multi-day trip, will not be making the trip to the Middle East until he sees "the tax cut through to the finish line." "The largest tax cut in American history is a landmark accomplishment for President Trump and a relief to millions of hardworking Americans," his office said in a statement. "The Vice President is committed to seeing the tax cut through to the finish line. The Vice President looks forward to traveling to Egypt and Israel in January." Pence's Middle East visit was shaping up to be a victory lap after President Donald Trump officially announced earlier this month that he recognizes Jerusalem as the capital of Israel. Pence was originally scheduled to meet with Palestinian Authority President Mahmoud Abbas on the trip, but a Palestinian Authority official said last week that "they are no longer coordinating with them [the U.S.] on this visit," noting they were unaware of the delay. "There will be no meeting with the vice president of America in Palestine," Abbas' diplomatic adviser, Majdi al-Khaldi, said three days ago. "The United States has crossed all the red lines with the Jerusalem decision." A senior White House official said on Wednesday that Abbas' comments on the Trump administration's decision reflected the kind of rhetoric "that has prevented peace for decades." This entry was posted in National Security and tagged CNN, Donald Trump, Egypt, Israel, Jerusalem, Mike Pence, Tax Reform. Bookmark the permalink.